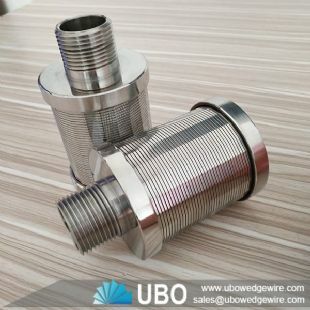 Why using Wedge Wire Screen Filter Nozzles instead of plastic Filter Nozzles? This article described the reason for your reference. Filter nozzle also named screen nozzle is a kind of metal filter nozzle which is made of stainless steel and other materials. 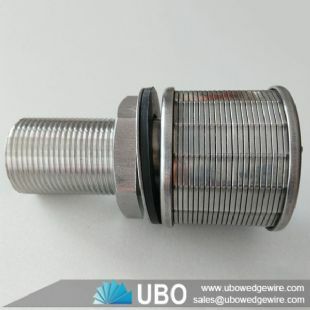 This filter nozzle adopts the wedge wire which is welded with support rods. It is a new generation of water treatment equipment that helps users solve the worries of original plastic filter nozzle. It solves the problems that plastic filter nozzle is poor in strength, pressure resistance, temperature, aging resistance. Besides, it is safe, reliable, integrated and costs low, used widely in filter industry. 1) Greater strength than ABS/PP material. 2) High precision in slot size. 3) High precision in roundness. 4) High slot open area to meet the requirement of large flow. 6) Long life, resistance to corrosion and high temperature (>135°C). 7)Very low maintenance costs than other material. 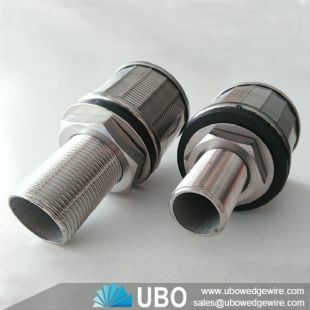 To conclude, UBO filter nozzle is ideal choice based on their combination of the above features. Why not have a try with stainless steel filter nozzles to see how it works and performs.